Unbelievable Story: A Collector Shares the Excitement of Participating in Upper Deck’s Bounty Program! Brian G. is a passionate collector who has taken advantage of Upper Deck’s new Bounty program. Upper Deck Bounty is an achievement program that rewards collectors for doing what they do best; collecting! For over a year now Upper Deck has challenged fans to put together specific sets in NHL® SP Authentic, NHL Synergy®, NHL Artifacts® and now Goodwin Champions. 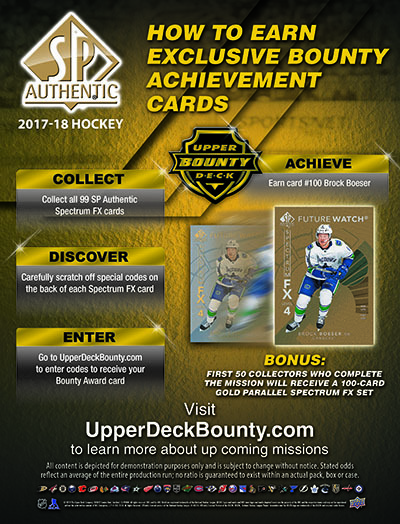 Upper Deck Bounty codes have been added to these insert sets that allow collectors to redeem their sets at UpperDeckBounty.com to earn awesome achievement cards and sets! The really difficult part of the Upper Deck Bounty program is that it is a race so the pressure is on to put together these sets before other collectors trying to do the same thing. It can be stressful, but if you can be one of the first to complete these missions by redeeming a full set, the excitement of earning the achievements can last a lifetime! We talked to one collector who dove right into the first ever Upper Deck Bounty Challenge for 2016-17 NHL® SP Authentic and had an incredible experience, check it out! “So first I must say. I started collecting when I was four-years-old, back in 1986 because of my mom. She was the biggest 49ers fan ever and was in love with Joe Montana, probably in an unhealthy way. In 1991 she bought case after case of Upper Deck Football in search of what I remember being one of the first autograph cards inserted in packs. I cannot explain the elation and joy when she hit one, I felt an odd sense of achievement as well, even though my allowance at the time afforded me three packs a week. “I have ALWAYS loved SP Authentic and really became an avid fan in 2004 with the start of my football rookie autograph patch collection. These days I probably buy way too much. 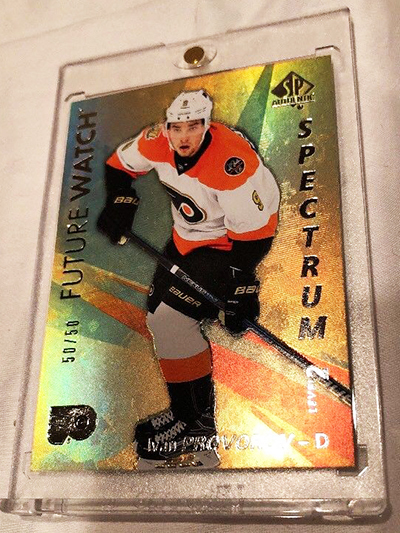 As I was busting my first case of 2016-17 SP Authentic Hockey, I started noticing the “Spectrum F/X” inserts. Not knowing what they were, I ignorantly tossed them aside with my base figuring I would collate them later. The owner of World of Collections in Edmonds, WA came over to chat with me as he usually does while I break in the store, started telling me about the Spectrum F/X set and the new “Upper Deck Bounty Program” were I could earn special cards not available anywhere else just for being one of the first to put it together. I WAS IMMEDIATELY ALL IN! 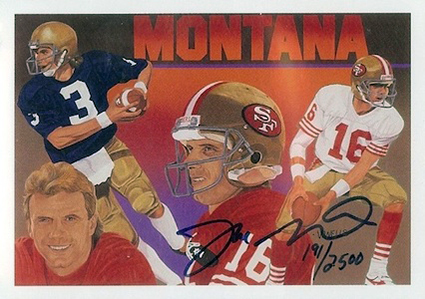 I grabbed my smart phone to get more info on UpperDeckBounty.com and when I saw there were only 50 total sets available and that it was going to be a challenge, this was like a flashback to my mom’s Joe Montana autograph hunt. “I went back to pull them back out, at the time my count was 23 with two duplicates, but I had already pulled Zach Werenski and another rare Level 3 card. After the end of a long day of breaking, I ended up with 63 of the 100 Spectrum F/X cards I needed. Luckily I pulled the William Nylander, Mitch Marner and Patrik Laine cards myself, but I still needed four of the Level 3 rookies. I quickly completed the veteran set within minutes of trading codes in an online forum. I then hit e-Bay and quickly tried to make deals with sellers just to obtain the codes. The sets were not going as quickly as I thought and it took me about three days to finish my first set. I entered my last code collecting set 18 of 50 on the Upper Deck Bounty website. “It was super easy pulling most of the Spectrum F/X cards and trading the duplicates for codes I needed. I didn’t have to get a second mortgage on my house to complete it. I can honestly say I spent less than $300 through online purchases on completing the first set between what I pulled and trading online. I still had about 13 codes left over and figured what the heck, I’ll enter into a new set. As prices settled I quickly finished another veteran set by night’s end. The bad news was that I only had one Level 3 rookie. I decided at this point I would do whatever it took to get another set, I was hooked. “I cannot remember the exact number, but it hovered around 28 sets remaining on the Upper Deck Bounty counter for a good day or two. I figured I had a while to finish, although I was able to pick up more Level 1 and 2 codes at a steady pace while working. I had actually met a new collecting friend from Canada (someone I purchased two codes from) and he was excited to hear about my progress on the second set. We were texting and it was then I learned from him as to the meaning of this sudden halt in set redemptions. People were sitting on the last code in hopes of entering it for the 34th set. Obviously they would receive a Gold Spectrum F/X rookie of Auston Matthews to his jersey number, which would command a nice premium above the others. And that is exactly what happened. After the 34th set was redeemed they were going at a faster rate and I knew time was running out. 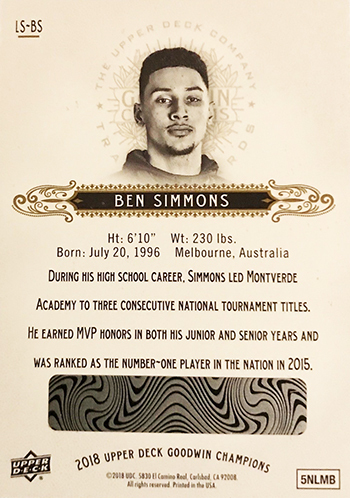 These achievement cards carry a huge premium and getting player’s jersey numbers for the serial numbering only add to that. “I can’t remember if it was exactly the next day or the day after, but I relentlessly refreshed the e-Bay browser as I needed only Werenski Puljujarvi and Tkachuk. Little did I know this would be the last day I would be able to redeem that last code for a Gold Spectrum F/X set. I had a doctor’s appointment in the afternoon and had my new friend helping me searching for the last three. Before leaving for the doctor’s office I had secured Werenski and entered the code and had found the Puljujarvi as well. There was hope. “On my drive on Interstate 5 into Seattle (about a 25 minute drive with traffic) I was going back and forth on my phone messaging the guy trying to work out a deal for the final card. I know trading and driving is frowned upon, but this was for one of the last sets available. He took his time getting back to me which put me in a state of panic. I walked into the medical building and checked in, sat in the waiting room and saw he had left his email for me to PayPal. I did it immediately. “I was called back to the doctor’s office and no lie, I was having my blood pressure checked and my e-Bay message alert pinged me. I pulled my phone out with the cuff still on my arm while apologizing to the nurse. After realizing this was going too far I let the medical assistant finish with my vitals and when she left I quickly entered the code into my online checklist. One freaking card left for Matthew Tkachuk who came so easily to me for the first set. 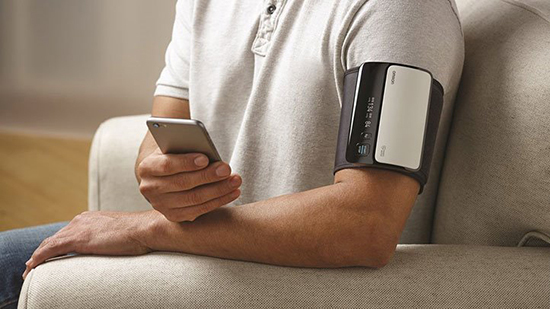 Trying to stay calm while having your blood pressure taken and collecting online is tricky! “I had some unread text messages from my new friend and he had tracked the only Tkachuk on e-Bay and after checking the Upper Deck Bounty website, I saw that there were only two sets remaining. I emailed the person selling the Tkachuk and tried to work a deal with him, but he was EXTREMELY hesitant about selling to me as I told him he could keep the card, I just wanted the code. I had to drive home from the doctor’s and the traffic was RIDICULOUS, so I could not keep looking down while driving. I had to get home safe so I could complete my mission. I called my new collecting buddy and begged him to get me that last card. “This may have been one of the toughest drives of my life and it felt like a medical emergency. If I didn’t get that Tkachuk code, I really felt like I might have a stroke. When I arrived home my friend had gotten the phone number of the seller just as the 49th set was redeemed. I was on the phone trying to talk as fast as possible trying to work out a deal and finally he gave in. I’m not even sure what I said at that point, it was all a blur. He read the code over the phone and my hands were literally shaking as I typed it in. I clicked the button to submit and time seemed to stop. Bounty programs are currently available in four different UD hobby products: Synergy, SP Authentic, Goodwin Champions and Artifacts! “When I saw the congratulations note that I had received set 50 of 50, I repeatedly thanked the seller who was still on the phone with me. When I hung up with him my phone rang and my friend asked frantically, ‘WAS THAT YOU?’ I sighed and sat quiet for a second. I was emotionally exhausted from completing my quest, but then it hit me and I yelled, ‘YES!’” We both had a great conversation about the journey and I thanked him repeatedly for his help. “I literally live 20 minutes from COMC.com who were the actual distributers of the set so I was one of the first to have a set in my possession. My friend who helped out had a daughter who was a HUGE William Nylander fan along with her father. I asked him for his address and he was curious as to why. I sent them the William Nylander 18/50 wrapped in tape on which I drew the American Flag and Canadian flag and wrote, ‘Two countries unite to complete the incredible 50 of 50 Upper Deck Bounty set.’ And that was that. “My favorite cards from this experience would be my 50 of 50 Shayne Gostisbehere, as he is my favorite player in the set, with the added bonus of the error as his name is missing from the back of the card. Christian Dvorak is cool as 18 of 50 is his jersey number (the only jersey numbered card I got). 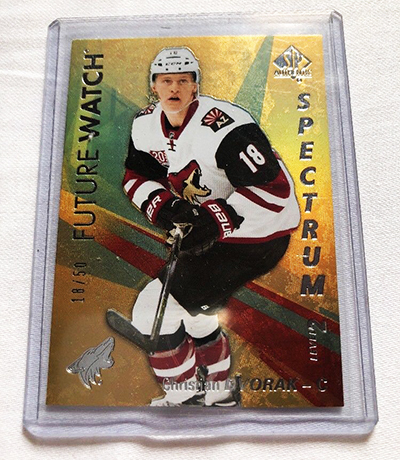 Lastly, I love my 50 of 50 Zach Hyman Gold Spectrum F/X card, which I had him sign. Amazing story Brian! 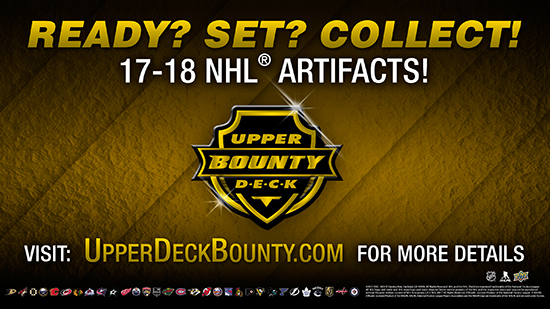 We’re glad you enjoyed the experience and if you haven’t taken part in Upper Deck’s Bounty program, you can join in on the Upper Deck Bounty program for 2018 Goodwin Champions now and 2018-19 NHL® Artifacts in a couple weeks! Happy hunting! 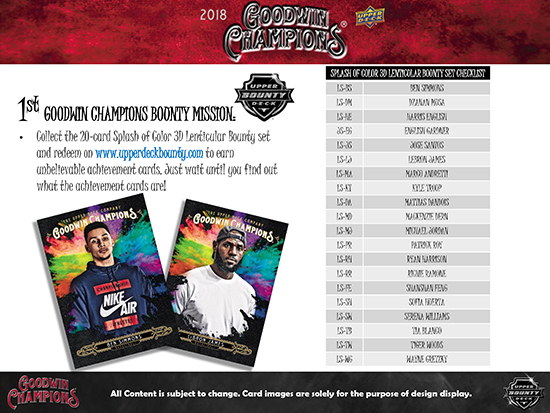 Not all Goodwin Champions Splash of Color cards have Bounty codes. Make sure you are checking to confirm they do if you are participating in the promotion!